Maintain short positions as the bias for a further retracement remains strong. 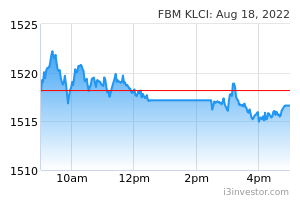 Yesterday, the FKLI ended its prior two sessions’ mild rebound, shedding 6.5 pts to close at 1,670.5 pts. It generally slid lower, and recorded a high and low of 1,680 pts and 1,667 pts. Overall, there were no price signals to suggest that the retracement leg – which started from the recent failed attempt to breach above 1,729 pts – has ended. Instead, the prior two sessions’ price rebound can be taken as a minor consolidation, before the retracement is resumed. We maintain our negative trading bias on the index. As technical evidence indicates that the bears are still in control of the market, we continue to recommend that traders maintain short positions. These were initiated at 1,698 pts, the closing level of 1 Mar. To manage risks, a stop-loss can be placed above 1,729 pts. Immediate support is maintained at 1,631.5 pts, the low of 18 Dec 2018, followed by 1,600 pts. Conversely, immediate resistance is expected at 1,729 pts, the high of 8 Nov. This is followed by 1,749.5 pts, the high of 17 Oct 2018.